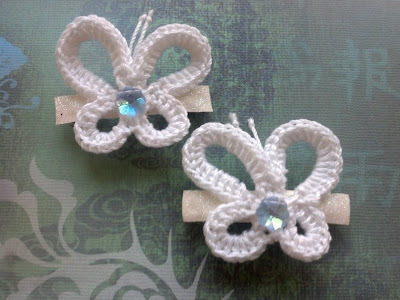 Sweet little clips that are cute for everyday wear but are also pretty enough for a special occasion. Using the wing portion of my fairy pattern make two "butterflies". For antenna fold a short length of thread. Tie knot in middle of bottom and one on each end of thread. Hot glue to back of butterfly. Cut two lengths of ribbon just slightly longer than the barrettes. I used a glitter ribbon that does not ravel but if you are using a satin ribbon be sure to finish off the ends with nail polish so they don't ravel. Hot glue ribbons to barrettes. Run a line of hot glue along the back of the butterfly along the top of the center hole. Quickly place butterfly on clip. Repeat for other clip. Be sure to glue the clips so they are reversed from each other. Blob some glue in the center hole and push in the bead. Clean off stringy extra glue. First attempt, got a little extra glue on them.